I didn’t know what to call this so I sort of borrowed something from Tolkein “There and back again” otherwise known as “The Hobbit” I don’t think I have violated any copyright..
Not quite fully packed – but close. I will set off at 7am tomorrow and should, allowing for breaks, be in Adelaide by noon. The first session will start tomorrow night around 6:30. Sounds odd, I know, but that allows everyone to get there, get settled and for the general business of roll call and agenda to be gotten out of the way, a get together for light refreshments and that concludes the Ist Session. From the 2nd Session onwards it will be full on for the next two days. The Dinner is on the Tuesday night, but I will not be attending that. I will, instead, stay in my hotel working on things that I need to get brought up to days – like my diary. I’ll probably go out and bring something in and have food here in my hotel room. Ah yes, they were built to last in these days. 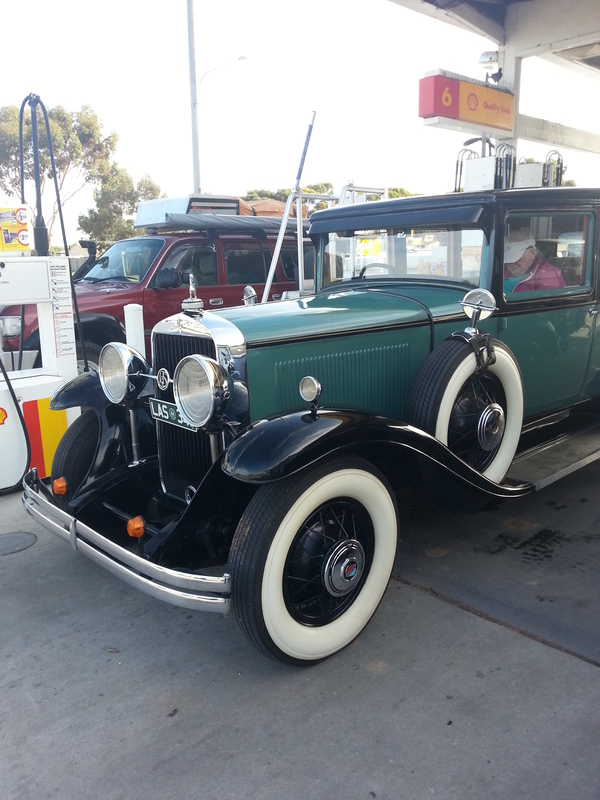 This was at the service station when I pulled in. Our visitor dog (Yogi) is still with us and he should be going back home today. It is only 6:20 and I don’t leave until about 7am. I do not like travelling on the road out of here in the dark so I generally wait until the sun is up. In summer time this means leaving about 6am. As far as I am aware, Jim is doing fine after his operation and should be home tomorrow, however, I think his wife is coming to collect Yogi sometime this afternoon after she has been at the hospital. He’s been no bother and my two are still ignoring him, although I have to say that they let him use their bed yesterday :o) Regrettably, my two, whilst loveable , are not really very sociable when it comes to other dogs. But then, they have always been with me, Chienna six weeks after she was born and Mannie since he was adopted ten years ago. They are very much family dogs and they like people – just not other dogs. The drive down here to Adelaide was very quiet until just about ten miles out of town. There was a smash on the inbound highway and two of the lanes were closed off and traffic was backed up for miles. Took me longer to travel these miles than it took me to travel down from Port Wakefield – 100 kilometres away. In the early stages of the drive I was thankful for my instance of not travelling at night because there was quite a few Kangaroos dead at the side of the road, plus a couple of foxes. Ok for a big truck not not in my Ford. After the introduction last night the first real session starts today. Good sleep, but it’s cold down here. I think it’s colder here than it is at home. Glad I brought a really heavy pullover with me :o) Although I have to say that the conference centre was well heated, so that was not a problem. Calling home during a break I found out that Yogi went home on Monday afternoon. And on the subject of going home, we believe that the business of the conference will be concluded by noon on Wednesday and since the emergency meeting has been cancelled, I may get home on Wednesday afternoon. Depends what I have to do here. ← Pergola, Aloe and noxious weeds.